For the last few seasons, we have worked at "Site 9ST62," located in a scenic area by the Broad River in Northeastern Georgia. 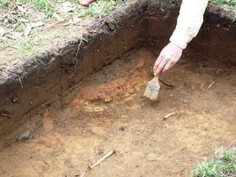 Last year, we exposed the edge of a house and its central hearth, and this year hope to find the rest of the house. We invite you to join us again at the "Bend of The Broad" this spring: our continued excavations at this site could provide significant and important information on a poorly known, but critical time in regional history!